Farewell 2013! It has been an amazing year full of adventure, creativity, love, and challenges. As I reflect back on my fond memories, I can't help but to smile because it has been one of my best years! I've grown closer to my family, friends, and other half, love my job and blog, and have personally grown stronger. From the bottom of my heart, I would like to thank you for all of the support and love on my blog. It has been an amazing first year and I can't wait to share my upcoming projects and collaborations. I hope everyone had an amazing year as well, cheers to 2014! Blouse: BR Monogram Silk Button Blouse from Banana Republic, here. Steal: Essential Semi-Sheer Georgette Top from Forever 21, here. Splurge: BR Monogram Silk Button Blouse from Banana Republic, here. Shirt: Hot Commodity Lace Midi Skirt thanks to Lily White, here. Steal: Hot Commodity Lace Midi Skirt from Lily White, here. Splurge: Romantic Bow Midi Skirt from Forever 21, here. Bracelet: Luxe Hut Crystal Bracelet thanks to Benevolent Jewels, here. Steal: Luxe Hut Crystal Bracelet thanks to Benevolent Jewels, here. Splurge: Betsey Johnson 'Iconic Pinkalicious' Stretch Link Bracelet, here. Rings: Two Gold Stacking Rings thanks to ThoughtBlossoms, here. Steal: Rachel Etched Midi Ring from Nordstrom, here. 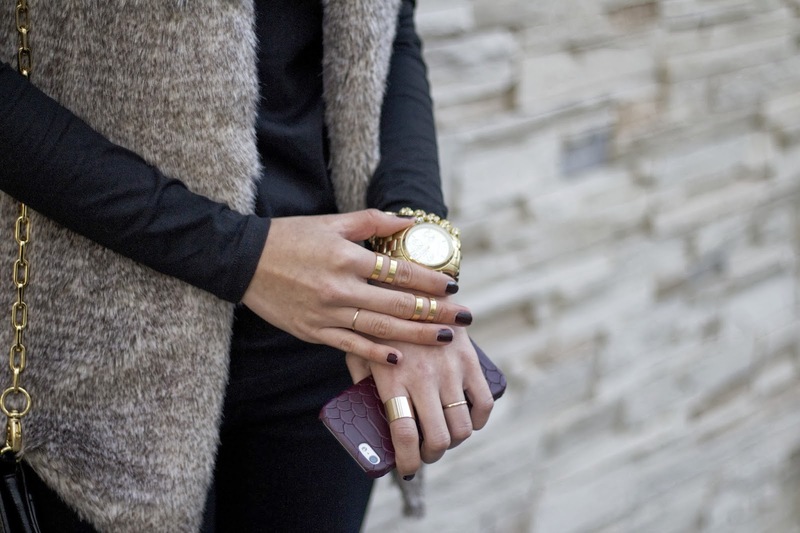 Splurge: Two Gold Stacking Rings from ThoughtBlossoms, here. Bag: Tory Burch Logo Clutch with Chain, here. Steal: Retro Envelope Crossbody from Forever 21, here. Splurge: Tory Burch Logo Clutch with Chain, here. Shoes: Chain Strap Heels thanks to DailyLook, here. Steal: Chain Strap Heels thanks to DailyLook, here. Splurge: Ivanka Trump 'Carni' Pump from Nordstrom, here. Phone Case: Burgundy iPhone 5 Hard-Shell Case thanks to Graphic Image, here. Merry Christmas everyone! I hope you're surrounded by your loved ones and got everything you wished for! Steal: Favorite Cable Knit Sweater from Forever 21, here. Splurge: Sequined Scoop-Neck Sweater from Old Navy, here. Steal: Lily White Skater Skirt from Nordstrom, here. Splurge: Press Sabine Chiffon Feather Skirt from Piperlime, here. Bracelets: Crystalized Gold Pave and Red Alyssa Tassel Bracelet. Steal: Crystalized Gold Pave from Benevolent Jewels and Red Alyssa Tassel Bracelet from Cathryn Ann. Splurge: Nordstrom Pave Link Bracelet and Sequin Link & Rope Bracelet from Nordstrom. Ring: Minimal Ring thanks to Rings & Tings, here. Steal: Minimal Ring from Rings & Tings, here. Splurge: Cutout Craze Midi Ring Set from Forever 21, here. Clutch: Grayson Bar Bag in Red thanks to Linea Pelle, here. Steal: MICHAEL Michael Kors 'Selma Stud' Large Saffiano Leather Zip Clutch, here. Splurge: Grayson Bar Bag in Red from Linea Pelle, here. Splurge: Guess Leena High Heel Pumps from Bloomingdales, here. Hello from Las Vegas! We're here for the Holidays and brr... is it cold! I overlooked the temperature here and under packed. It is quite the transition roaming from casino to casino, the environment quickly jumps from comfortable and cozy to cold and dry air. So stay warm everyone & Happy Holidays! This dress is drop dead stunning! I love every aspect of it, from the sweetheart cut to the wrapped effect to the tulip bottom. It is perfect for a night out or NYE! I would like to congratulate Linda for winning my Graphic Image iPhone case giveaway! I hope you enjoy your new cute personalized case. Dress: BCBGMAXAZRIA Short Shirred Jersey Dress from Nordstrom, here. Steal: Strapless Royal Blue Dress from Lulu*s, here. Splurge: BCBGMAXAZRIA Short Shirred Jersey Dress from Nordstrom, here. Shoes: Simple Strap Heels thanks to DailyLook, here. Splurge: RICHEMAYA Heels from Aldo, here. I am still confirming details from the winner of my Graphic Image giveaway and will announce the winner's name in my next post! Wishing everyone an amazing and eventful weekend! Vest: Tart Kya Vest in Grey thanks to Tart Collections, here. Steal: Romeo & Julet Couture Faux Fur Vest from Nordstrom, here. Splurge: Tart Kya Vest in Grey from Tart Collections, here. Top: Cotton Modal Scoop Neck Long Sleeve Tee from Ann Taylor, here. Steal: Essential Long-Sleeve T from Gap, here. Splurge: Cotton Modal Scoop Neck Long Sleeve Tee from Ann Taylor, here. Jeans: Black High Waist Skinny Jean thanks to GJG Denim, here. Steal: Black High Waist Skinny Jean thanks to GJG Denim, here. Splurge: Maria High Rise Skinny by J Brand Jeans from Bloomingdales, here. Necklace: Gold Karma Necklace from Thought Blossoms, here. Steal: Gold Karma Necklace from Thought Blossoms, here. Splurge: Dogeared 'Karma Sparkle' Boxed Pendant Necklace, here. Bracelet: Mary Bracelet from Happy Wrist, here. Steal: Fancy Curb Chain Bracelet from Forever 21, here. Splurge: Mary Bracelet from Happy Wrist, here. Rings: Two Gold Stacking Rings thanks to ThoughtBlossoms, here. Double Band Ring Set thanks to DailyLook, here. Minimal Ring thanks to Rings & Tings, here. Steal: Rachel Etched Midi Ring from Nordstrom, here. Earthy Wreath Midi Ring Set and Simple Stated Midi Ring Set from Forever 21. Splurge: Two Gold Stacking Rings from ThoughtBlossoms, here. Double Band Ring Set from DailyLook, here. Minimal Ring from Rings & Tings, here. Steal: Titanium Bracelet Watch, 38mm from Nordstrom, here. Shoes: Chinese Laundry Gladly Booties thanks to DailyLook, here. Steal: Julianna Hough for Sole Society 'Giuliana' Bootie, here. 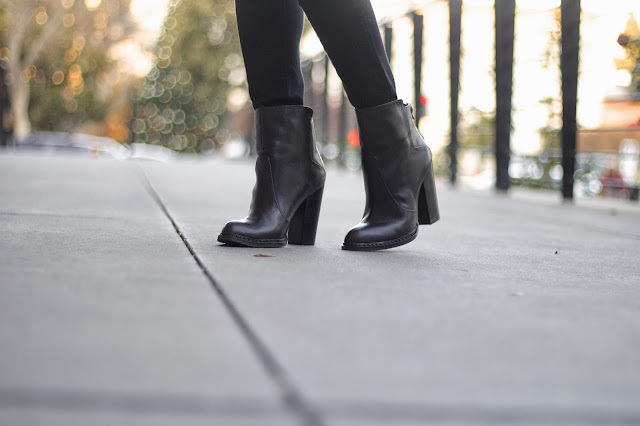 Splurge: Chinese Laundry Gladly Booties from DailyLook, here. Can you believe that Christmas is within a few days? I went to the mall yesterday for last minute Christmas shopping, and it is a zoo there! Parking was almost impossible, every store was packed, and the lines to checkout were super long. If you don't like crowds and can avoid the mall, I highly recommend it because it took us hours to buy a few things! But with all crowds and lines aside, I absolutely love the festive decorations that the stores put up and the twinkling Christmas lights that light up the night. 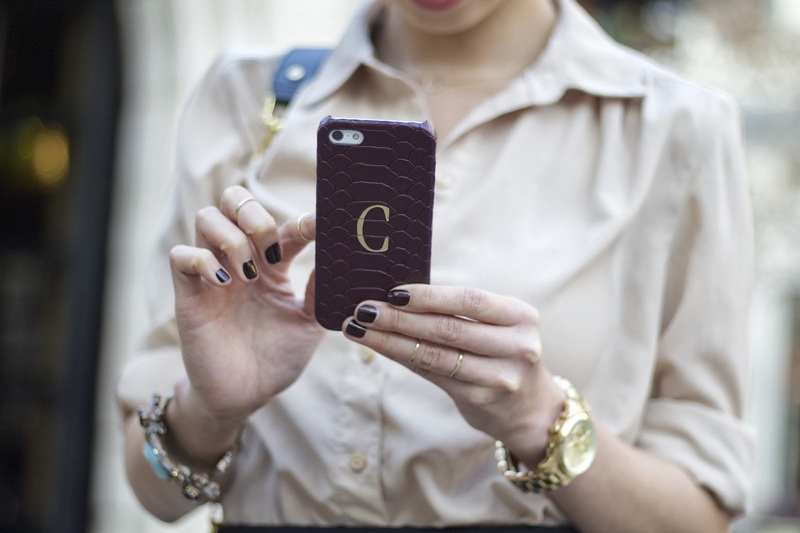 Don't forget to check out my current giveaway for a chance to win a personalized iPhone case, here. I have a maroon one with my initial "C" print and absolutely adore it! Jacket: Touch of Gold Anorak Jacket thanks to Thread & Supply, here. Steal: Touch of Gold Anorak Jacket from Thread & Supply, here. Splurge: Billabong Victoria Jacket from PacSun, here. Steal: Basic Raglan Top from Forever 21, here. Splurge: Vintage Sweatshirt from J.Crew, here. Skirt: Lasso Chambray Skirt thanks to Lily White, here. Steal: Lasso Chambray Skirt from Lily White, here. Splurge: Denim Skater Skirt from Zara, here. 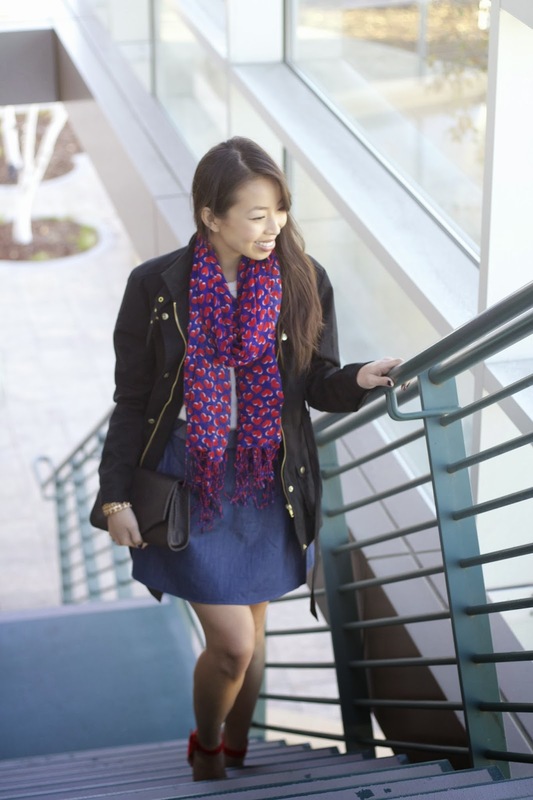 Steal: Women's Diamond-Pattern Gauze-Twill Scarf from Old Navy, here. 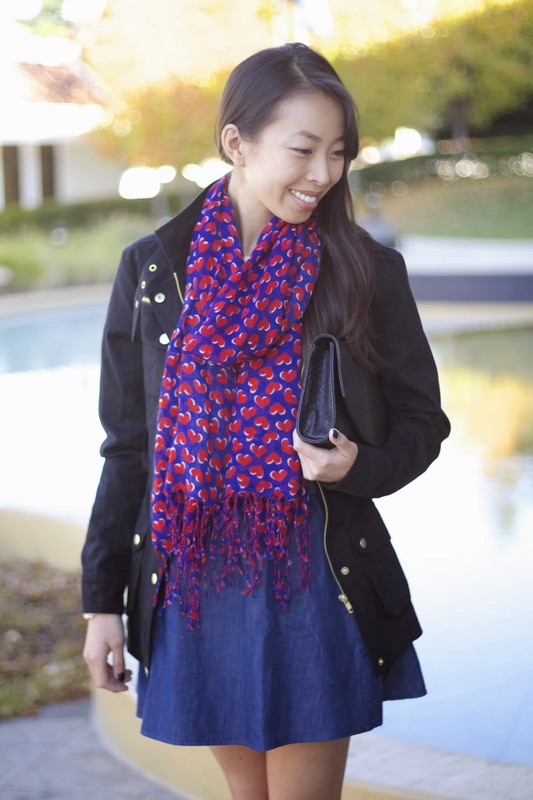 Splurge: Cashmere Jacquard Heart Scarf from Burberry, here. Bracelets: Red Alyssa Tassel Bracelet thanks to Cathryn Ann, here. Mary Bracelet thanks to Happy Wrist, here. Steal: Cara Tassel Macrame Bracelet and Fancy Curb Chain Bracelet. Splurge: Red Alyssa Tassel Bracelet from Cathryn Ann, here. Mary Bracelet from Happy Wrist, here. Shoes: Red Ankle Strap Stilettos thanks to DailyLook, here. Steal: Red Ankle Strap Stilettos from DailyLook, here. If I had to describe my ideal Holiday outfit, it would be something along the lines of this look. 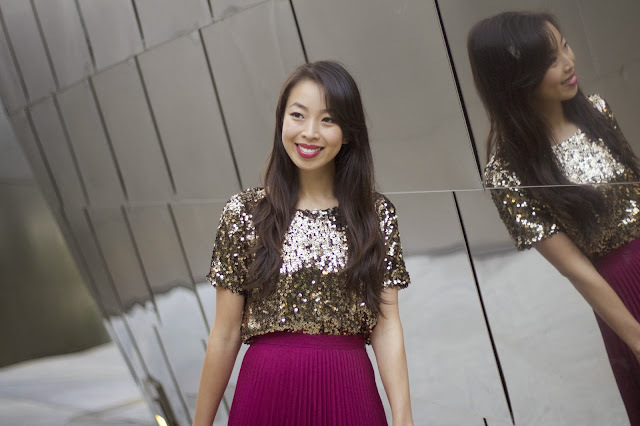 I love the sequins, the rich color and the romantic pleats on this skirt. 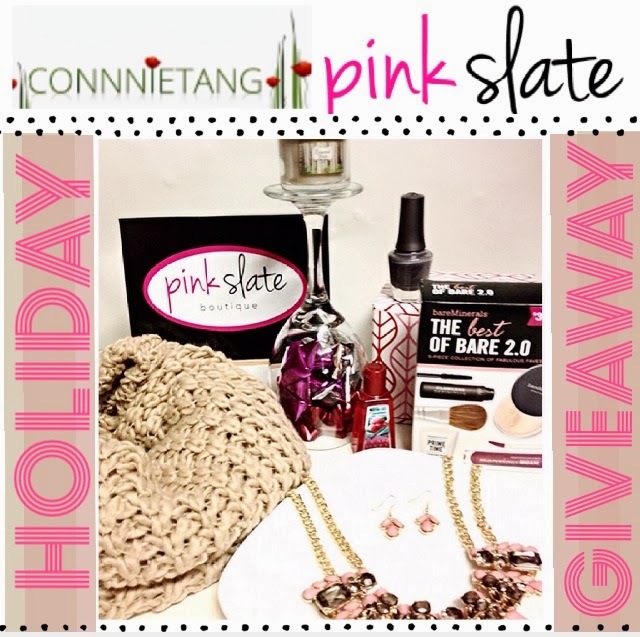 This look is perfect for a holiday work event, gift exchange with the girls, or dinner with someone special. Check out my current giveaway with Graphic Image for a chance to win a personalized iPhone case, here! Jacket: Ark & Co. Cute Black Blazer thanks to Lulu's, here. Steal: Ark & Co. 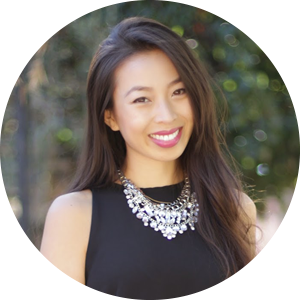 Cute Black Blazer from Lulu's, here. Splurge: Trouve Foiled Faux Leather Trim Blazer from Nordstrom, here. Steal: Cute Sequin Top from Lulu's, here. Splurge: Sequin & Lace Top from Banana Republic, here. Skirt: Blaque Label Magenta Maxi Skirt thanks to Lulu's, here. Steal: Classic Maxi Skirt from Forever 21, here. 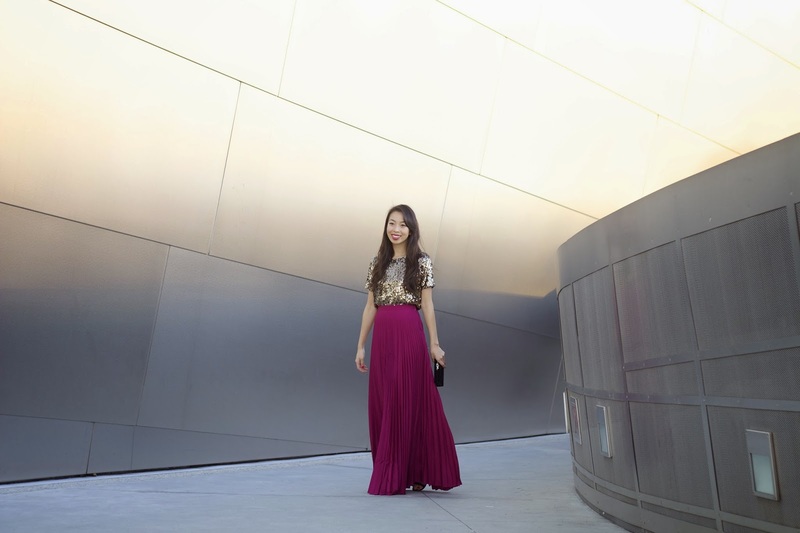 Splurge: Cute Magenta Maxi Skirt from Lulu's, here. Bag: Love and Jaguar Black Velvet Clutch thanks to Lulu's, here. Steal: Tasha Faux Patent Box Clutch from Nordstrom, here. Splurge: Love and Jaguar Black Velvet Clutch from Lulu's, here.